A World Watched Keenly: Big Martians in a Tiny Town ~ The History Girl! It is reported that at 8:50 P.M. a huge, flaming object, believed to be a meteorite, fell on a farm in the neighborhood of Grovers Mill, New Jersey, twenty-two miles from Trenton. The flash in the sky was visible within a radius of several hundred miles and the noise of the impact was heard as far north as Elizabeth. 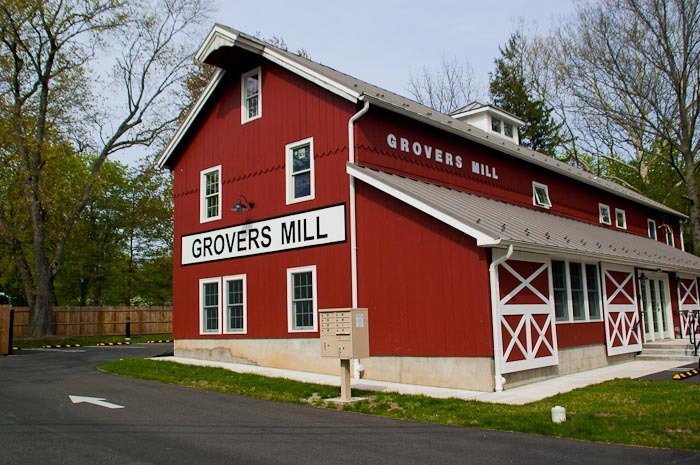 Grovers Mill is seemingly unremarkable: an unincorporated town nestled in West Windsor Township, it blends in seamlessly with the Princeton area’s scenic and unique aesthetic. It would be easy to drive right through it without discerning its relevance; however, on October 30, 1938, it was ground zero for a brutal extraterrestrial invasion detailed dramatically by 23-year-old Orson Welles in his broadcasted adaptation of War of the Worlds. 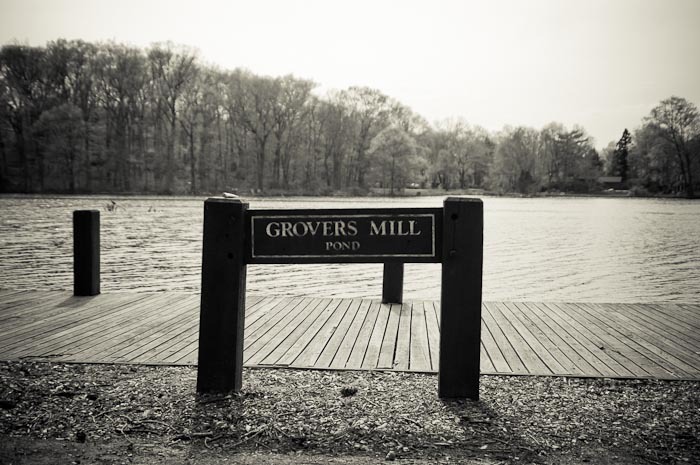 On a beautiful spring day with newly bloomed leaves and barely a breeze in the air, there are Boy Scouts fishing in the millpond of Van Nest Park, a small and inconspicuous playground right off of Cranbury Road. In the middle of the park, set back from the street, is a sizeable monument to that fateful evening. It depicts Orson Welles narrating the invasion, a terrified family gathered around their home radio desperately clinging on to his every word, and of course the tentacle-laden flying saucers that materialized out of the sky hell-bent on destroying humanity. The monument to the pandemonium and fear that ensued during the famous War of the Worlds broadcast is a stark contrast to the tranquil surroundings and a surreal experience for any enthusiast trying to superimpose this chaos against the flat calm of the millpond. War of the Worlds was a figment of several imaginations. Its impact, however, was not. The fictional invasion that started in the little village of Grovers Mill expanded with the frightening speed that’s only possible through futuristic, otherworldly technology. The piece continues to be taught today as a testament to the power of the media over consumer as well as to plain human gullibility. While Orson Welles broadcast from a tiny room in New York City, people all over America were frightened into hysteria at the mere suggestion of chaos, the source of which they did not comprehend. With the sheer variety of people who are fascinated by War of the Worlds for any number of reasons (sci-fi enthusiasts? H.G. Wells connoisseurs? Orson Welles fans? Media historians? 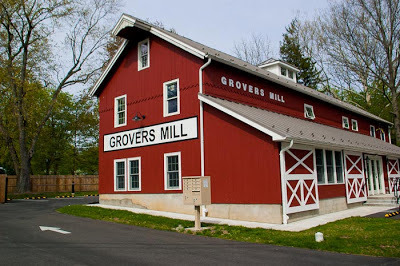 The list goes on)the people of Grovers Mill could probably find ways to turn the town into some type of tourist attraction. They have not. In fact, a 1986 article in the Gettysburg Times quotes the former mayor Stanley Perrine as being “very sick of”War of the Worlds and remarked that it was just a cruel joke played on a humble farming town (forgetting, temporarily, the other estimated 12 million people listening that night and wondering, quite genuinely, if they were going to die at the hands of interplanetary beings). Though it is unclear if this rather hostile sentiment is echoed today, it could be a contributing factor to the town’s continued aesthetic loyalty to its early days. This, in ways, says a lot about the nature of the town itself - it remains a quiet hamlet in the midst of bustling, overcrowded suburban New Jersey, hardly changed from the days when they got invaded by fictional aliens (and even before that), a quality that reflects a subtle disinterest in change. 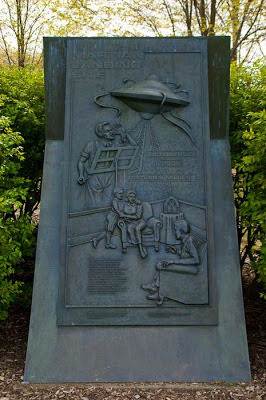 War of the Worlds Monument in Van Nest Park. 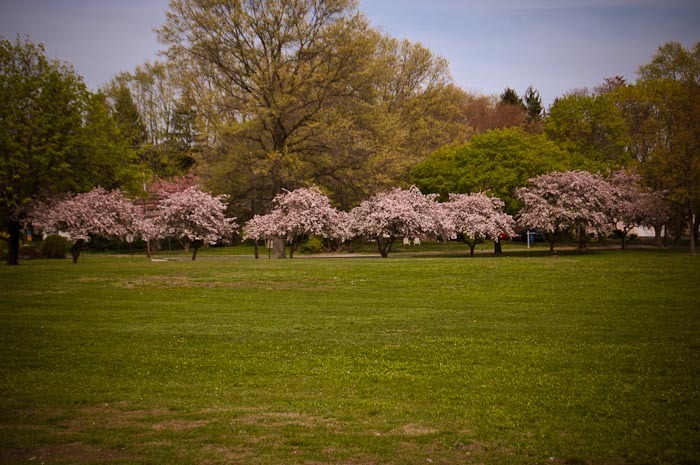 West Windsor Township is one of the oldest towns in New Jersey, dating back to 1682, when William Penn founded it after signing a treaty with the Lenni Lenape tribe. The mill after which the town was named switched owners several times prior to 1868, when Joseph Grover purchased the mill and established his family prominently in the town. Similarly, according to war-ofthe-worlds.co.uk, a website dedicated to exploring the historical aspects of the radio broadcast, the mill pond had switched names several times since receiving its first title of Bergen Pond in 1776, finally becoming Grovers Mill Pond when the Grover family rose to distinction in the village, owning most of the property in it. Due to apparently subpar recordkeeping, it is difficult to pin down exact dates for a vast majority of the turning points in the village’s history- estimated timelines for property sales, even the date of the opening of the mill, remain imprecise at best. The most glaring tangible homage to the family is the Grovers Mill Barn, a bright red structure clearly labelled with the village’s name. Like most important buildings in the village, the date of its completion is unknown (though estimated to be in the late 1800s). 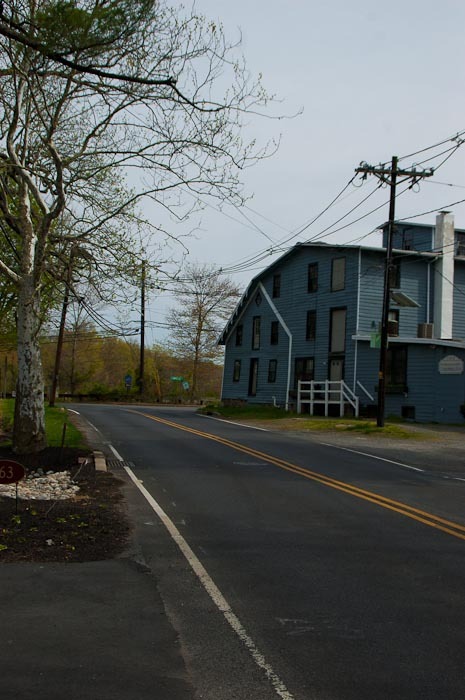 At first used in conjunction with the mill, the barn later became its own separate entity as a feed store, then a power equipment business, and currently offers office and apartment space for the discriminating renter looking for a space that’s just the right shade of red. That’s not to say there’s no recognition, however reluctant, by the town of Grovers Mill of their contribution to a pivotal event in media history: the Grover’s Mill Coffee House has a shop of kitschy mugs and t-shirts with a Martian drinking their fresh-roasted coffee; in the past they've held tongue-in-cheek events celebrating the anniversary of War of the Worlds; the company that owns the aforementioned Grovers Mill Barn is called Martian Holdings. Irrespective of that, with the very clear value placed on the town’s deep roots in the fledgling America, the delightful irony of it becoming the target of incomprehensible space-age warfare is certainly not lost on anyone. Maggie McBride is a freelance Jersey girl of many trades: photographer, editor, writer and creative thinker. She is the mind behind Talkies are Telling, where she analyses the cultural values espoused by the popularity of films (along with frequently flat-out making fun of Michael Bay). She is also a contributing writer and assistant editor for I.D.E.A.L. Magazine, a publication for disabled urban youth and their empowerment through education, sports, entertainment and fashion. She can be contacted at maggiejoan@gmail.com.